Did you know that Denny’s has a customer’s rewards system that will get you updated on the latest news, offers and exclusive discounts. The thing is you need to sign up to join this system. For easy access we post every significant Denny’s printable coupon here in thenewcoupon.com. They also give freebies when you celebrate your birthday with them. To search for nearest restaurant in your area you can use their online restaurant locator. There are four restaurants that I know in Manhattan. Check online for your area. 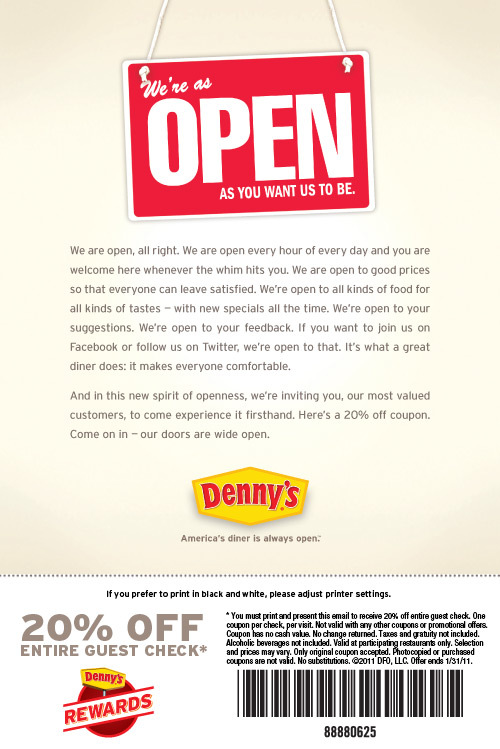 This Denny’s printable coupon will expire on January 31, 2011 valid for 20% discount on entire guest check.